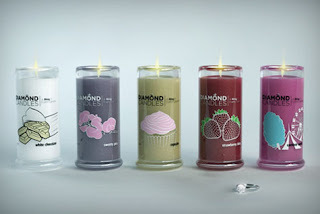 Diamond Candles only $12.50! (reg $25) Each Candle Has a Ring Worth $10 to $5000! Head over to Half Off Depot to get Diamond Candles for only $12.50. These regularly cost $25 each! I was able to review these candles last year, and they are awesome! To me, the ring inside was a just nice bonus...the candle itself is well worth the purchase. The smell filled my living room within minutes and lingered for a long time (a few days after burning it!). The candles come in nice scents like Apple Slice, Carnival Candy, Chocolate Truffle, Cinnamon Roll, Cupcake, Gingerbread Latte, Honeydew Melon, Lavender Lemon, Strawberry Bliss, Tropical Retreat, Vanilla Cream and more.